It has been a ceremonial few weeks for Steven Gerrard. He netted his 150th goal in professional football during Liverpool’s clash with Manchester United in September, a poignant strike in the wake of the revelations about the Hillsborough disaster, of which the youngest victim, Jon-Paul Gilhooley, was his cousin. At the beginning of this month the Liverpool captain made his 600th appearance for his club; this week he will earn his 100th cap for his country. Such monumental figures have put him amongst the elite of club and country, and serve to emphasize what has been an outstanding career. He is tenth in the list of all-time appearances for Liverpool, behind the likes of Emlyn Hughes, Ian Rush and Tommy Smith; 8th top scorer, trailing behind Robbie Fowler, Kenny Dalglish and Michael Owen, but is the club’s record goalscorer in Europe. His century of England caps will see him join the esteemed company of Billy Wright, Bobby Moore, Bobby Charlton, Peter Shilton and David Beckham. A glance at the midfielder’s extensive list of honours shows that Gerrard deserves to be bracketed amongst the most iconic players of England’s past; one UEFA Cup, three League Cups, two FA Cups and a Champions League, not to mention a glittering array of individual awards. However, merely listing his achievements does not begin to tell half the story. To state that Gerrard, at the top of his game, won a Champions League and FA Cup final in successive seasons overlooks his seismic interventions in both. 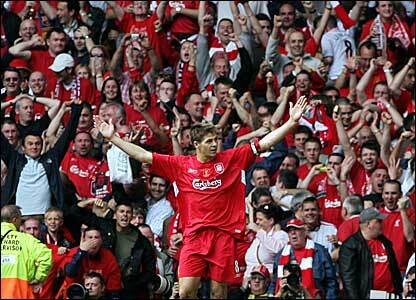 Few players have imprinted themselves on major club finals as impressively as Gerrard did during the mid-noughties. As monumental as his leadership was during the comeback in Istanbul, his individual brilliance in Cardiff just a year later far surpassed it. Despite such undeniable success at club level, Gerrard has been the subject of inexplicable criticism throughout his England career; he has suffered from the perception that he does not care about his country nearly as much as he cares about his club, because the heroics that lifted Liverpool in major tournaments and finals have not been repeated in international tournaments. Largely this is due to England not possessing the players that have consistently brought the best out of Steven Gerrard. Throughout his career at Liverpool he has had a base to work from, provided by one of Dietmar Hamann, Xabi Alonso or Javier Mascherano. Those capable of providing the same for England – Owen Hargreaves, Scott Parker, Michael Carrick – have either proved injured, ignored or inferior. The incessant willingness of a series of England managers, dating back to Sven-Goran Eriksson, to pair Gerrard with Frank Lampard in central-midfield has continually bewildered critics. The dearth of top-quality English holding midfielders has been the greatest hindrance to Gerrard replicating his stunning club form with his country. But Gerrard has cut a rather unappreciated figure at international level. A win percentage of 65, allied with 19 goals and 19 assists are overlooked by critics who have wanted Gerrard to act as the marauding menace he was so regularly with Liverpool. 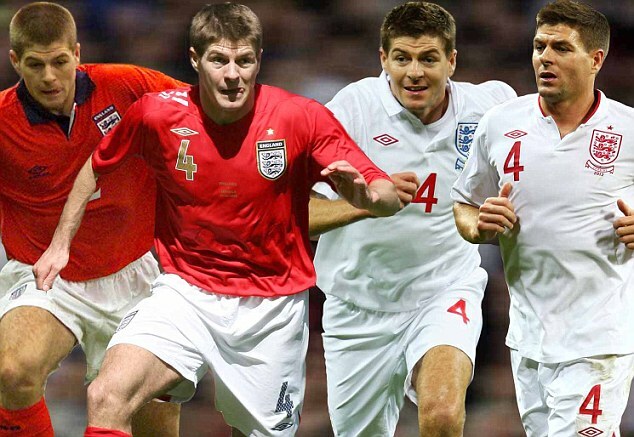 Though Gerrard may not have taken an international tournament by the scruff of the neck, he has been England’s most consistent performer in the past decade, where fellow illustrious team-mates – namely Lampard and Wayne Rooney – have underpeformed. 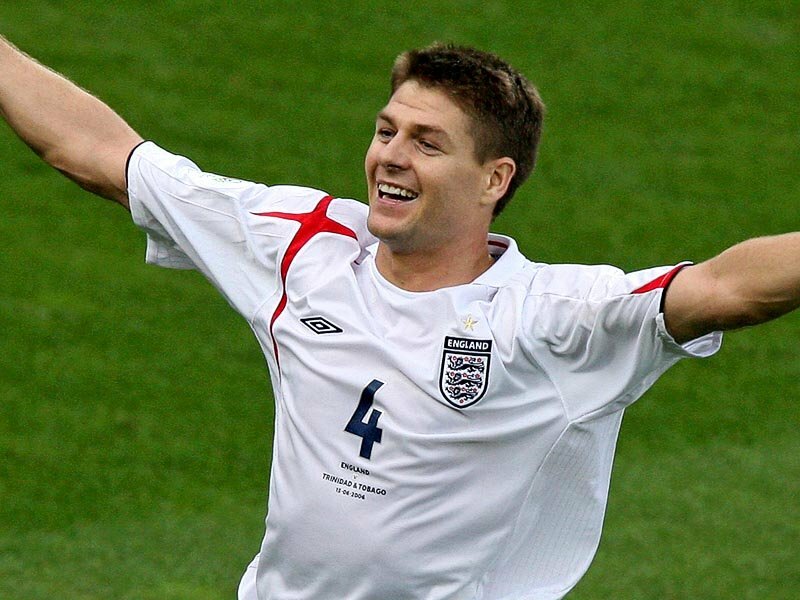 Three goals in two World Cups tell only half the story; since Germany 2006 Gerrard has either assisted or scored 7 of England’s 14 goals at international tournaments. His performances during Euro 2012 saw him named in UEFA’s team of the tournament; the only English player to make the cut. 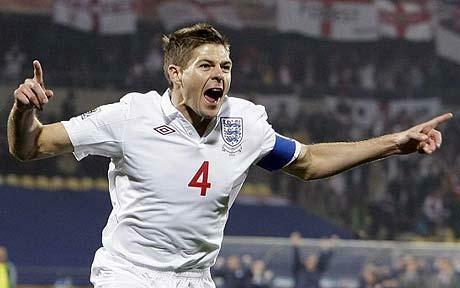 That Gerrard had to wait until Euro 2012 to be England’s permanent captain is nothing short of a travesty. Fabio Capello’s perplexingly persistent dedication to John Terry’s cause, and his subsequent resignation, would have been easily avoided had he not mistaken Gerrard’s quiet, confident authority for inhibition. Popular belief would also tell you that Gerrard has been the victim of his own positional versatility. This popular perception has been allowed to breed and multiply amongst various media outlets and most popularly publicized by the Sky Sports generation. It has become a crude generalization, one that has not allowed the footballing public to fully appreciate the majesty of Steven Gerrard. The Liverpool captain has, in fact, contrary to popular belief, benefitted from his versatility. Gerrard is effective in the centre of midfield, where he currently plays for club and country, but he suffers from the inhibitions that a tactical strait-jacket impose on him. Remove the tactical shackles and you will bring the best out of Steven Gerrard, something that, up to now, only Rafa Benitez has been prepared to do. The individual awards alluded to earlier were a consequence of Gerrard being removed from the rigidity of central midfield. In the 2005-6 season he primarily operated on the right-hand side of midfield; in the process he scored 23 goals and won the PFA Players’ Player of the Year. From the back-end of the 2007-8 season he operated in tandem with Fernando Torres, as Benitez brought the 4-2-3-1 system to Anfield. Between 2007 and 2009 Torres scored 50 goals in 84 appearances, Gerrard 45 in 96. Gerrard’s talismanic efforts and 24 goals during the 2008-9 season saw him awarded with the Football Writers’ Player of the Year, but he fell short of adding the Premier League to his haul of trophies; it is a sad indictment that his best season in a Liverpool shirt will forever be remembered as his greatest missed opportunity. As impressively consistent as Gerrard’s league form became between 2007 and 2009, it is his ability to imprint himself on the biggest stage of all that will see his legacy endure. Liverpool’s debt to Steven Gerrard following his heroics in Istanbul on May 25th 2005 have been well documented. He may have hauled his side back into the contest almost single-handedly from 3-0 down at half-time, but his commitment and ability was most demonstrably illustrated during extra-time where he operated as an auxiliary right-back to counter AC Milan’s Serginho. Steven Gerrard is a better player than he has been given credit for, his medal haul and the sheer volume of his goals reflect this. He is the only player to have scored in an FA Cup Final, League Cup Final, UEFA Cup Final and Champions League Final, but his record is tinged with regret and unfulfillment. This is not to say that he would have profited away from Anfield, but that at boardroom level his obvious talent has not been continually backed. Had he not been a witness to the dramatic erosion of Liverpool’s backbone in an 18-month period he would unquestionably have added to his already impressive medal haul. Becoming the sixth English centurion is not merely, as it was for David Beckham, a book-end to a career. It is strange to say about someone in Gerrard’s ilk, a 32-year old captain of club and country, but he is very much in a transitional phase. Between 2007 and 2009 he was the best midfielder in Europe. Age and injuries have shorn him of his explosive pace and power; his reversion in recent years back to centre-midfield has seen a different side of his game come to the fore. He excelled there for England in the summer, and he has been ever-present in Liverpool’s three-man midfield so far during the 2012-13 Premier League season. With the injury problems that saw him fail to play for his country at all in 2011, and make just 39 league appearances in two seasons, appearing to be behind him, the focus is now on how much further Gerrard can prolong his career. His set-piece delivery has improved immeasurably and the emphasis of his game now revolves more around his passing and positioning than his ability to single-handedly change games. Simultaneously, though, his goal return has plummeted; he has failed to reach the double-figures mark since the 2009-10 season, and this season he has just two in 17 games. Injury has seemingly clouded his mindset and caused a severe decline in both his characteristic surging runs through midfield and iconic ball striking ability. Liverpool have looked overrun in midfield this season; it is no coincidence that Joe Allen’s performances have dropped significantly in recent weeks. Similarly to Hamann, Alonso and Mascherano, Joe Allen and the injured Lucas Leiva are the only current Liverpool midfielders that can provide a base for Gerrard to play at his marauding best. With Lucas’ return expected in the next few weeks, Brendan Rodgers has the opportunity to place Gerrard either at the apex of Liverpool’s midfield or wide on the right of Liverpool’s front-three. This entry was posted in Player profiles and tagged brendan rodgers, champions league, david beckham, england, fernando torres, frank lampard, john terry, liverpool, premier league, rafa benitez, Roy Hodgson, steven gerrard by James Dutton. Bookmark the permalink.